There is an age-old debate: Can fashion be comfortable? Is it possible for these two to function in tandem? Or is fashion and comfort mutually exclusive? With people now aspiring to dress in a fashionable manner as well as be comfortable, more and more fashion brands are trying to put an end to the fashion vs comfort dichotomy and create something that is a blend of both. That is how Liva was born. For those who do not know, Liva is a new age, eco-friendly, high quality, soft, fluid fabric made from natural (wood pulp) cellulosic fibers. Liva recently launched its #UnboxWithLiva campaign that is all set to break the stereotype that fashion and comfort cannot coexists together. The main aim of the campaign is to put an end to the fashion vs comfort debate by offering both at the same time. The fabric is the spine and foundation of a garment and is often the unsung hero of fashion. Therefore, this post is all about celebrating Liva. The look for the post has been planed with the aim to highlight the key features of Liva. I have layered two high-low hem tunics together. Both of them are from Global Desi and belong to the pink family. The inner one is on the coral side with cerulean blue embroidery. 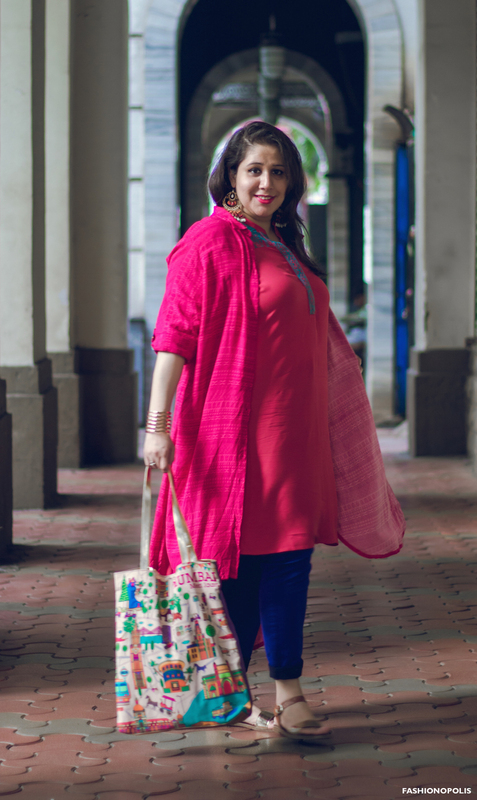 The outer printed tunic, styled as a duster coat, is in fuchsia pink. 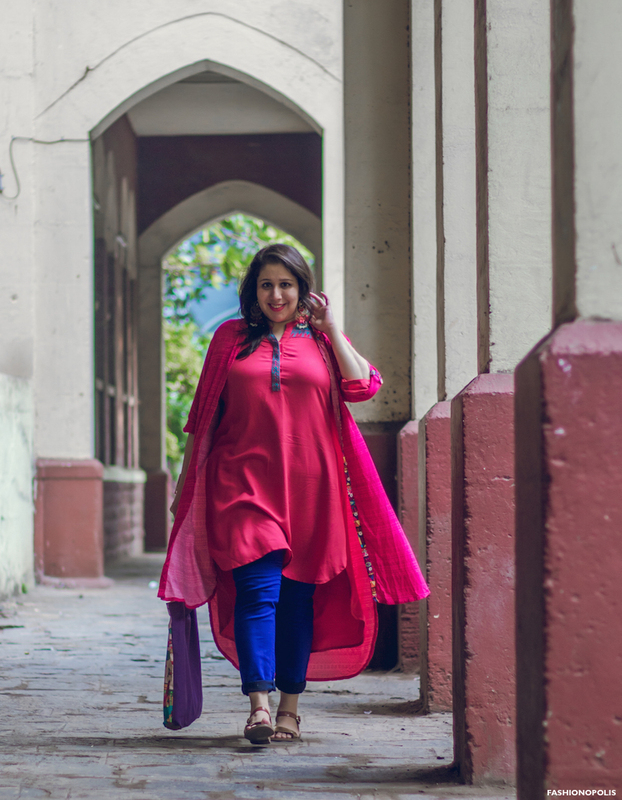 To make the pink colours stand out I paired it with a contrast cobalt blue pants. No stranger to Liva, I have loved it ever since I discovered it. These are the reasons why I am a fan of the fabric. The key feature of Liva is fluidity. The fabric’s inherent free flowing characteristic makes Liva a perfect choice for a number of silhouettes and drapes. From tunics to palazzos and from structured jackets to flowy dresses, the fabric can be styled into a variety of shapes and designs. 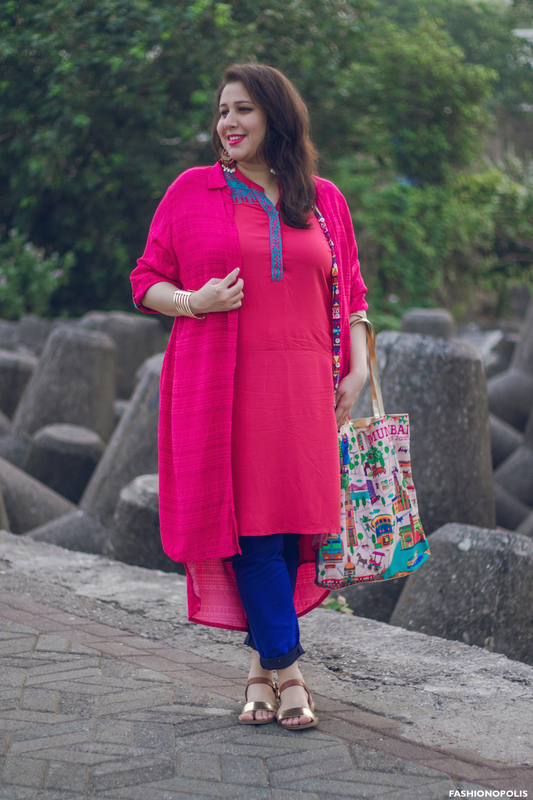 Being plus size I always look for fabrics that drape well on my body and do not make me look larger than my size or shapeless. Since the USP of Liva is fluidity, the fabric has a graceful fall that drapes beautifully on every body shape and size. While it is lightweight, the fabric is not flimsy. What I most love about Liva is, at no time does it add bulk. 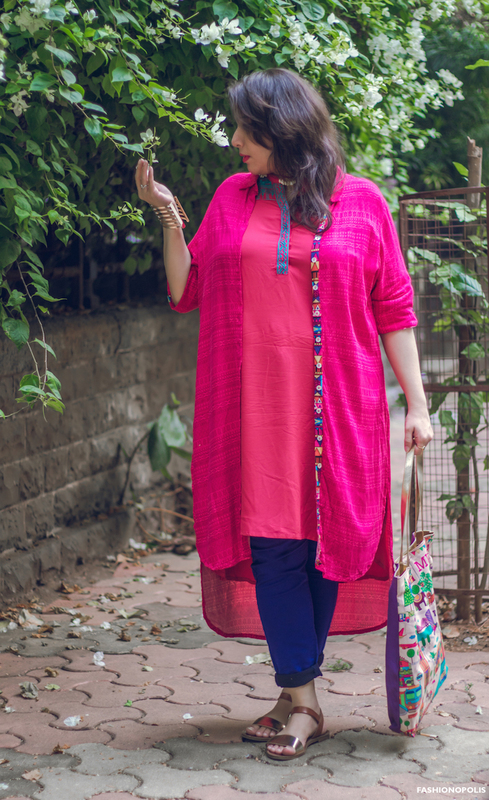 Even when layering multiple pieces the overall look is body shape and size flattering. 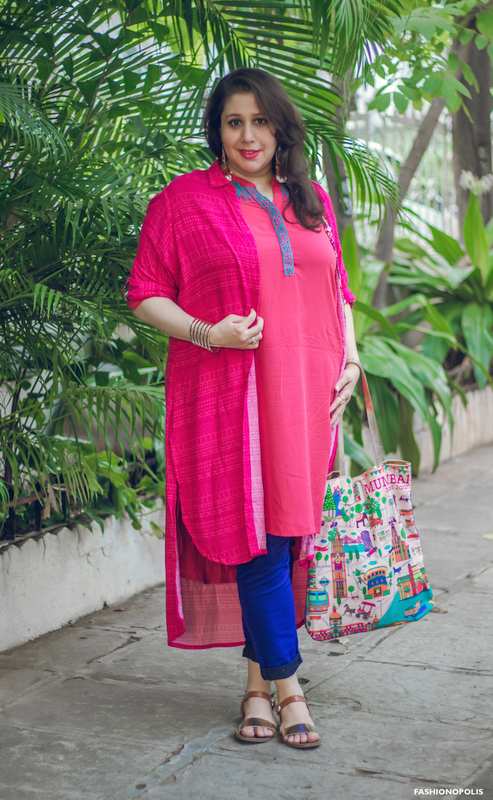 This is boon for any body shape or size, but for plus size it is a matter of joy. 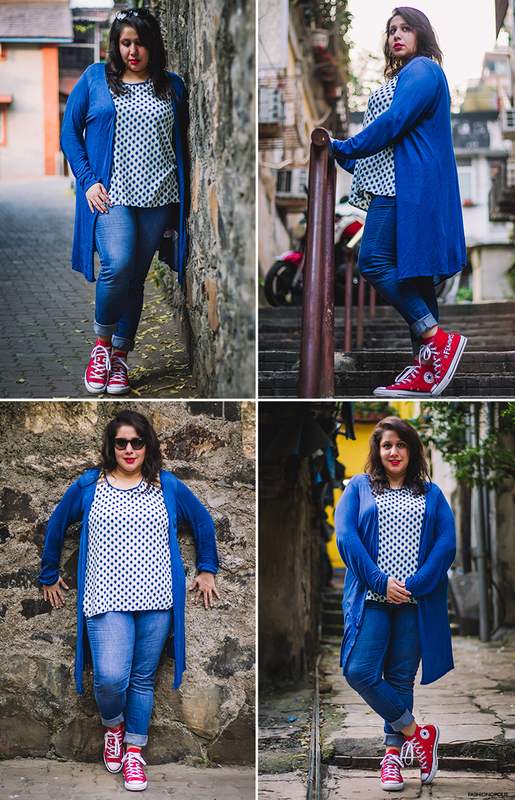 This feature of Liva makes it easy for us plus size women to pick form-flattering garments in a variety of styles and silhouette, plus, gives us the confidence to layer pieces together. Liva has a natural sheen to it that adds to the vibrancy of the colours. If you look at any Liva garment, whether it is in a bright or pastel shade, the colours stand out. Even the most somber colour has a rich and lustrous look to it. Liva is a durable fabric too. The colour does not fade even after multiple washes. Liva is made from natural cellulosic fibers because of which it has great absorption ability and breathability that allows the skin to breathe easily and provide comfort even on the most hot and humid days. Along with being skin friendly, Liva, compared to other natural fabrics such as cotton and linen, creases much lesser. Liva is made from natural fibres, produced from wood pulp. This is a natural renewable resource. The pulp used is from the trees that are specially grown for this purpose and more trees are planted than cut down. The best part is, it conserves more water in comparison to other natural fabrics. With the growing need and demand for minimising the gap between quality fashion and wearable comfort, Liva has been pioneer on that front. Offering consumer a product that is a fine balance of fashion and comfort. Along with being fluid, lustrous, skin-friendly fabric, Liva is also ideal for all weathers, flattering to all body types and suited for most occasion. The one thing I have learnt during my years working as a fashion designer is, most women are really very clueless! Oh, they know the latest trends and the kind of dress they want, the fabric the colour right down to the shade of the sequins. However, most of them are happily unaware of the most integral detail: their body shape. I have spent endless hours explaining to brides-to-be and clients why their dream outfit is just wrong for their body. 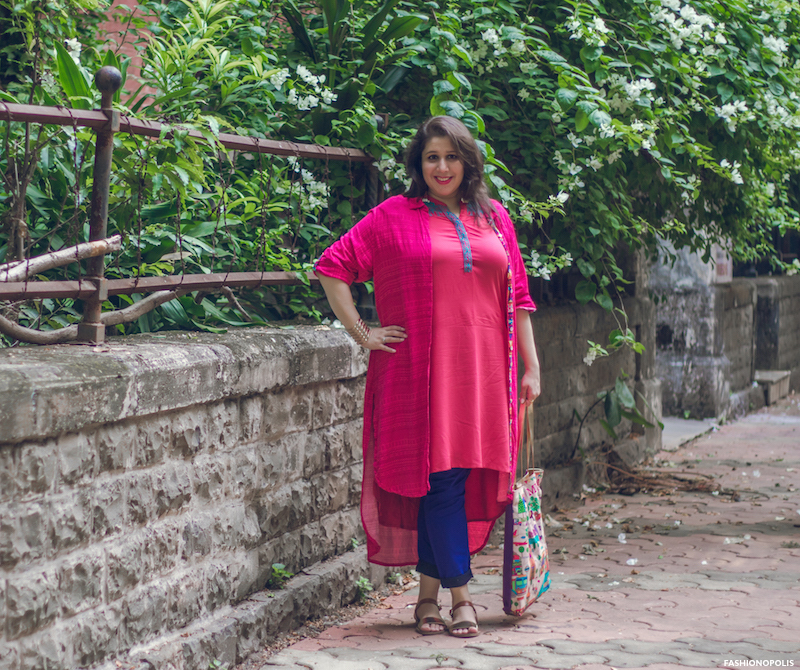 Yes, you are thin, and yes, you have a “similar” body to a Bollywood actress, but that alone is not enough to decide if a specific outfit is apt for your body shape or not. Our bodies have a specific structure that can largely be broken down into four basic shapes: Apple, Pear, Rectangle and Hourglass. Not sure whether you are a pear, apple, rectangle or hourglass and wondering, “what is my body shape?” Head to Myntra app for all your answers. To help you find the right fit for your body shape and type, Myntra has launched a brilliant feature called Shop by Shape. The Shop by Shape Guide helps you identify your body shape and type, offers suggestions on how to flatter your shape and find pieces that best suit a particular shape. 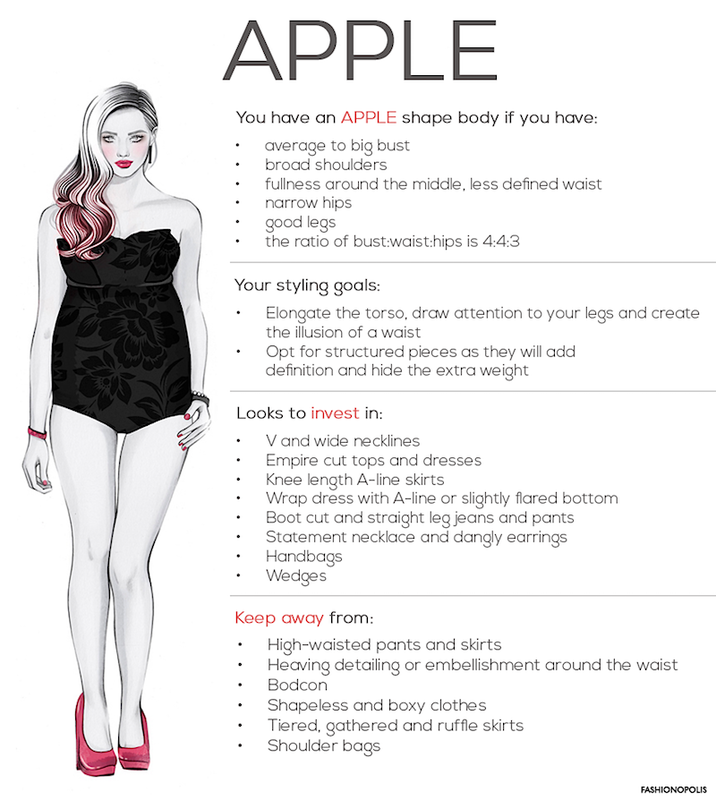 Not only will this feature help you understand your own body shape better, but it will offer recommendation and help find clothes that best suit you body type and shape. 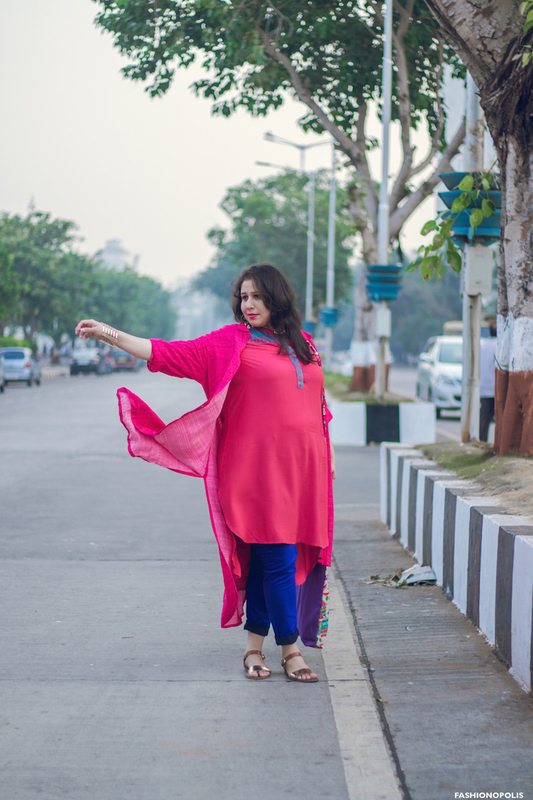 What I love about Myntra’s Shop by Shape feature is, along with educating women about their own bodies, it also celebrates body diversity. Women of all shapes can now find something for themselves. 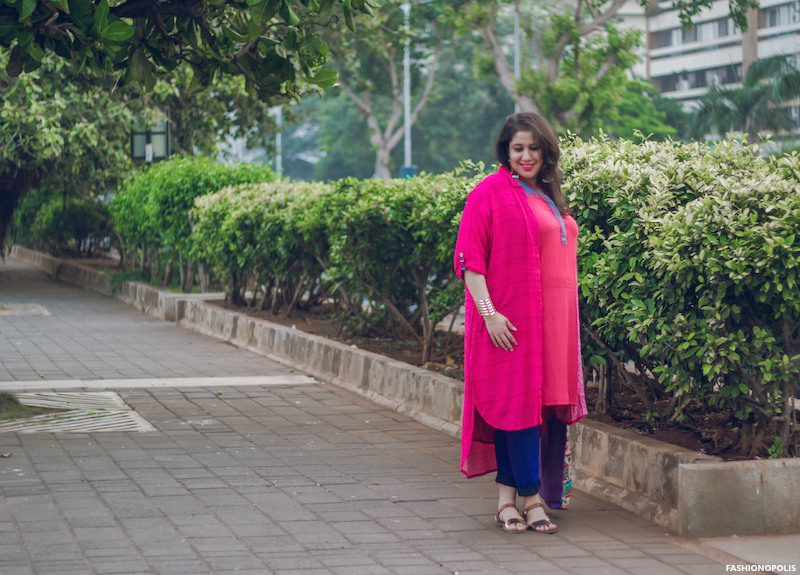 In a country with diverse body types and shapes, Myntra is helping women of all shapes find the perfect fit for their body type. At some point in life you need to take a leap of faith and follow your own heart. The first time I did that was when I decided to quit college and go to fashion school. Never in a billion years did I think it would be my first eye-opener to the real world. Since fashion school is primarily about sketching, sourcing and sowing my dad suggested I buy shoes that would be comfortable for doing all my tasks and activities. That is how I discovered Converse. While looking for comfortable shoes we ended picking my first pair of non-gym sneakers. Before getting a pair of Converse, I used to only wear sneakers for an out of town holiday or at the gym. 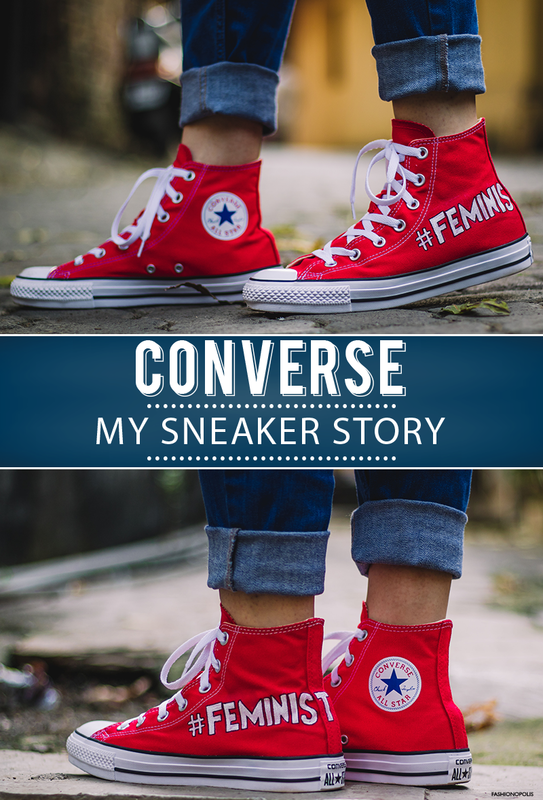 To think back to it – I started my career in fashion in a pair of Converse. Since we use our feet for practically everything we do, our shoes are invariable a part of our life’s journey. They are with us when we start a new journey or scaling the heights of success. They dance with us in our moments of happiness or help us navigate a rough patch. At some point your shoe stops being just a shoe and become an integral part of who you are. This is exactly the philosophy of Converse Chuck Taylor All Star series. The Chuck is not just a sneaker, but an idea. Every new pair carries a powerful message: This is your blank canvas waiting to be filled, ultimately becoming a unique celebration of your true, authentic self. Last month, Converse introduced its biggest campaign, Made By You, to celebrate its iconic Chuck Taylor All Star shoes. The core concept of the campaign is, Converse patrons are given a chance to transform their beloved Chucks from canvas sneaker into an artistic canvas. 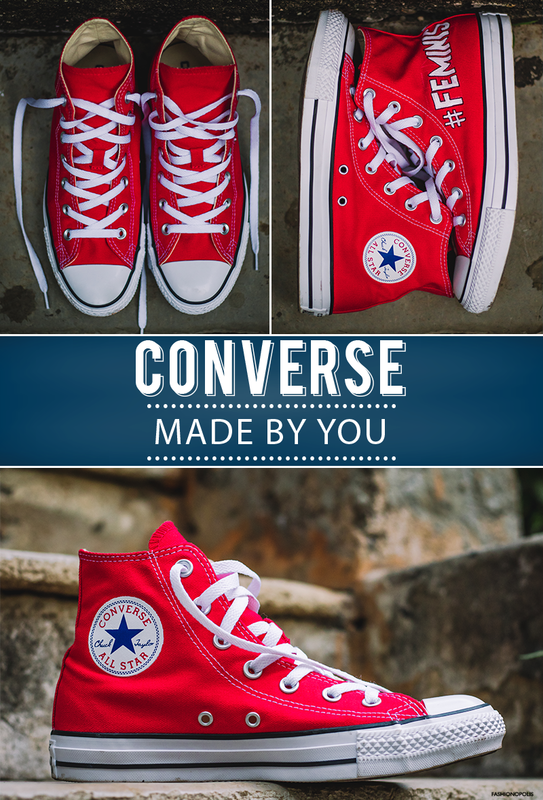 The main aim of Converse ‘Made By You’ campaign is to combines customisation and visual storytelling and give consumers a chance to show off their individuality, their emotions, their lives, and their true, authentic self. Whether you are a famous celebrity travelling the world or a girl next door trying to make her mark, your Chucks tell a story. Your story. When I got a chance to tell my story through my Chucks I knew exactly what I wanted it to be. There are a lot of things that make me who I am. I am a voracious reader, an avid sudoku player, a fashion lover, a devout pop culture junkie, a wannabe political analyst, an aspiring traveler and so on. But the one word that describes me perfectly is – Feminist. Above everything else, I am an egalitarian who is a strong believer of gender equality, equal pay, equal marriage, equal parenting and equal rights. 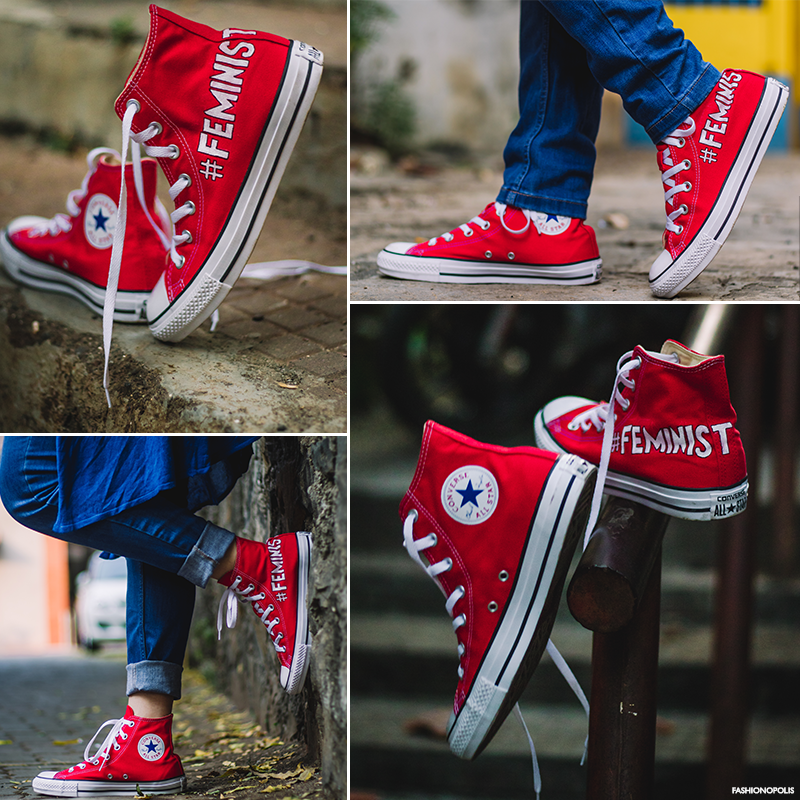 Other than expressing my true, authentic self, I also chose to get the word #Feminist painted on my Chucks as a way of paying homage to all those feminists who have paved the way for my generation. Form Mary Wollstonecraft to the Suffragettes to Gloria Steinem to Emma Watson and many other nameless women and men who have fought for women’s rights and gender equality. The best way for me to express my gratitude as well as carry forward the feminist legacy is by unabashedly pledge my allegiance to feminism and everything it represents. Whenever I wear my pair of red Converse Chuck Taylor All Star sneakers, it brings to life a very intrinsic part of me and lets me show my personality and beliefs in a creative way. Like me, if you too feel passionate about something and want to show your love and support for the same, Converse Chuck Taylor All Star sneakers are the perfect canvas to do so and let the world know that those Chucks not just represent you but also are Made By You!